Marbles Make Fun and Unique Tie Dye Patterns... Great for Creating Unique Homemade Gifts! If you love learning new tie dye techniques, you'll definitely want to give marbles a try! They make an awesome tie dye pattern, kind of like fireworks. I've made tie dye t-shirts and tank tops, using various tie dye techniques, such as the traditional 60's style spiral and these easy pleats (my husband's favorite)... but I felt like this fun tie dye pattern would look really cool on a unique piece of clothing. 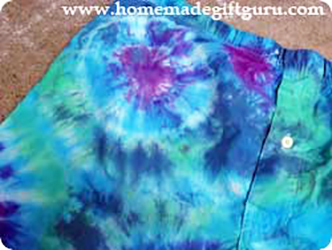 So... my friend and I chose to create a pair of tie dyed men's boxer shorts for a funny homemade gift (but you can tie dye just about anything with marbles). Now that they're tie dyed, they're going to make a fun and funny homemade birthday for a good friend of ours. He's not a teen (check out teen gifts here) but he is certainly young at heart! The white boxer shorts came from Target, cost around $5 and have a button on the fly! 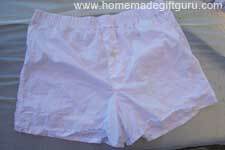 I had to search a little because I didn't want any of the boxer shorts with elastic showing since elastic won't dye. ...whatever you can think of! Whatever you choose to dye, this tie dye technique is super fun and relatively predictable (in a whimsical kind of way). You can use marbles of various sizes. You'll need a few. I squeezed as many as I could into this project and used lots of color. 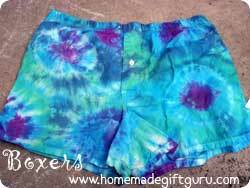 If you're new to tie dye, you may like to check out these tie dye instructions plus tips. You can also learn more about the cold water dyes and tie dye supplies I use for my tie dye projects. 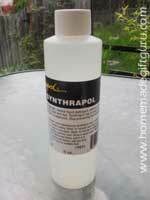 To complete your own cold water tie dye project you'll need the following tie dye supplies (learn more about each supply here). ...While your fabrics soak, the next step in the tie dye instructions is to prepare your work space. Put Gloves on and Squeeze Water From Fabric. Once fabric has been soaked in soda ash, put on gloves and squeeze out excess water from fabric. Keep fabrics moist. Don't let them dry out before dying them. If you need to, put them in plastic bags for a short time between soaking them and dying them to keep them moist. Wrap some marbles. 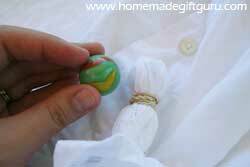 For this tie dye technique, choose various places to wrap and bind a marble snugly in your fabric using rubber bands. Leave it at that for a rather simple circle or for a more vibrant pattern (like shown above), wrap another rubber band, binding just fabric this time, a little ways below the marble. I used the giant sized marbles here for a rather dramatic effect. Continue to bind marbles in your fabric until you feel satisfied. The more marbles, the wilder your results. Everywhere you choose to bind a marble will result in a circle radiating out and the bulge under that will be what surrounds your circle. Here's a simple example of what you'd get without the second bunching below each bound marble... of course, this is using only one color as well. Either way, a variety of colors will create a more intense effect. Prepare Dye. Follow instructions on your dye for preparation. Procion MX dye requires 2 teaspoons of powdered dye to be added to 8 oz of water. For lighter colors you can add more water if desired. You can apply dye using a squeeze bottle to squeeze it where desired or by pouring it, from a cup, onto desired area. Both methods work, but squeeze bottles provide more control, plus they are easier to mix (simply shake well). Tip: It's a good idea to mix your dye in a place away from your fabrics and work area to avoid specks of powder from blowing over onto your projects or your work space. Squeeze or pour dye as desired. Add color however you choose. If you're unsure of your color palette or needs some tips, there are several tie dye tips on the tie dye instructions page. Be sure to get inside any folds if necessary (a squeeze bottle is helpful for this, shown below). Tip: Use a kitchen trash bag for each piece of fabric, to both contain the mess as you dye and then to wrap your project in afterward. Cover Project. You always want to keep fabrics damp by covering them in plastic. Some people use gallon sized zip lock bags or simply plastic wrap. In this case, you can enclose the fabric right in the plastic kitchen bag, pushing out any air and twisting the bag up securely. Tip... If you're dying several things, you may want to put your individually bagged projects together in an additional plastic kitchen trash bag (to be safe in case of a leak and to keep them all together). Rinse fabric in warm water to remove excess dye. Remove rubber bands and marbles one by one, careful not to let the marbles go down the drain. Unravel as you rinse. Continue rinsing until water runs nearly clear. Important Tip: Be aware that wet tie dyed fabrics resting against each other or other fabrics for a long time still have a chance of transferring color. Take them right out of the wash when done and dry immediately. Fabrics. 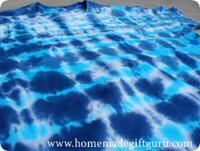 You can use this tie dye technique or variations of it with any fabric that can be tie dyed. Marbles. 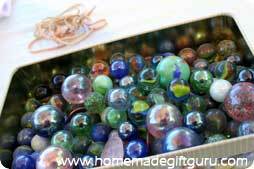 You can use various sized marbles for different effects. Colors. 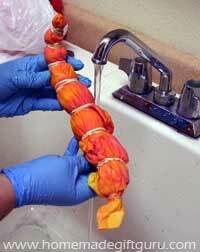 You can use one single color, a couple or several during the tie dying process for very different results. Techniques. And you can make simple little circles like those on the yellow bloomers or wild and crazy blasts of color as seen above. You may also like to learn the classic 60's style spiral tie dye technique or this easy and beautiful circle tie dye technique that radiates outward like a sun and is perfect for beginners. This easy tie dye pattern looks a bit like sunshine radiating out from the sun... check it out here! This is what happens when you make pleated folds in a shirt and then tie dye it!